Several times each year I desire to enlighten my soul by resting my body and mind. Taking myself on an internal journey to find the beauty within by attending a few hours in a spa recommitting myself to fitness, health, relaxation and inner peace. There is something magical that happens when you enter through the front doors of a spa. The calming music that is playing in the background gives you permission to leave your thoughts and worries at the doorstep. Neutral colors, aromatherapy, and the trickling sounds of nature are all experiences that I look forward to when I enter the serene environment of a retreat. A sanctuary to rejuvenate, revitalize and restore my mind and body. A few years ago Cory and I decided that we would gift to each other a couples massage for our anniversary. I found a spa close to our home that would allow us to use our lunch hour. I wasn’t sure how this would work or if we would even enjoy the experience. To our surprise the experience was amazing! I would recommend this to all of my friends. There are ways to bring this spa environment into our own homes when our lives get busy and too full to add one more event to our schedules. Sometimes staying home is the only alternative. The question arises, how do we do this? I believe we would all have different answers as to what would bring us to a calming state of mind. In my own home I have invested in candles, essential oils, body scrubs, a beautiful robe, music that calms my spirit and a few spa inspired recipes. Spa cuisine has a certain expectation for me. We need bright, fresh and colorful dishes that remind us to stay on a healthy course. I need to feed my spirit with a healthy philosophy. This will ensure my journey to a calming inner glow is achieved. My family and I are always striving to live with a healthy philosophy about our food choices. The recipes today are a reflection of those choices. Our everyday diets are filled with lots of fruit and vegetables, healthy fats, natural sweeteners and lean meats. Our mindfulness of what we put into our bodies allows us to stay active and nourished. Let me share with you a few ideas that can easily be followed when you are capturing the spirit of spa cuisine in your own home. Chose quality foods. Pamper yourself with a few favorites. Avoid processed food. Stay with fresh ingredients. Make spa water. Add a few mint leaves and lemon slices to dazzle your water intake for the day. Use local ingredients when possible. Relax. Close your eyes and clear your mind. Enjoy your food! Spa food is not about limiting what you eat but reintroducing modifications to how you eat. Make choices that will feed your body, soul and mind. It is not about being this way or that way but more about feeling complete and whole. I had left over pieces of salmon that were not suitable for skewering. I went ahead and grilled them anyways. I added the roasted dill and a wedge of lemon. It was perfect! 1. Soak skewers for 30 minutes in cold water. 2. Preheat oven to 425 degrees. Place a baking rack inside a cookie sheet. 3. Season both sides of salmon (skin removed) with onion powder, salt and pepper. 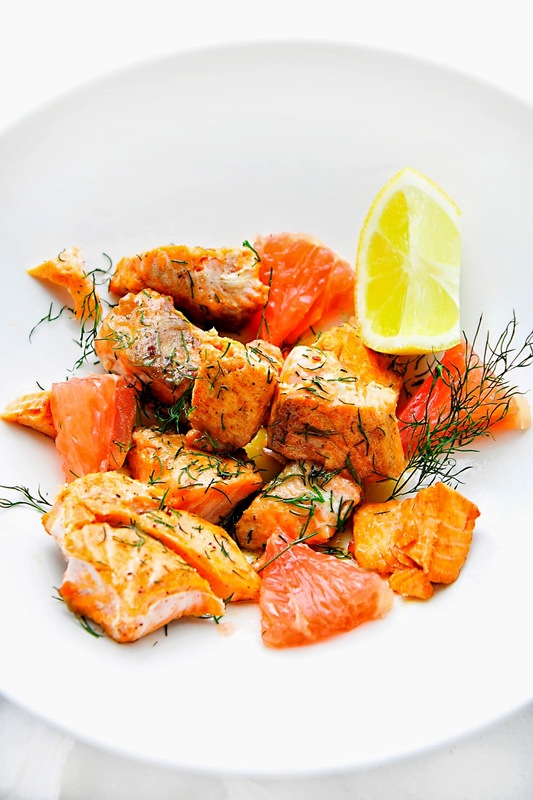 Prepare salmon, lemon and grapefruit according to ingredient list above. 4. 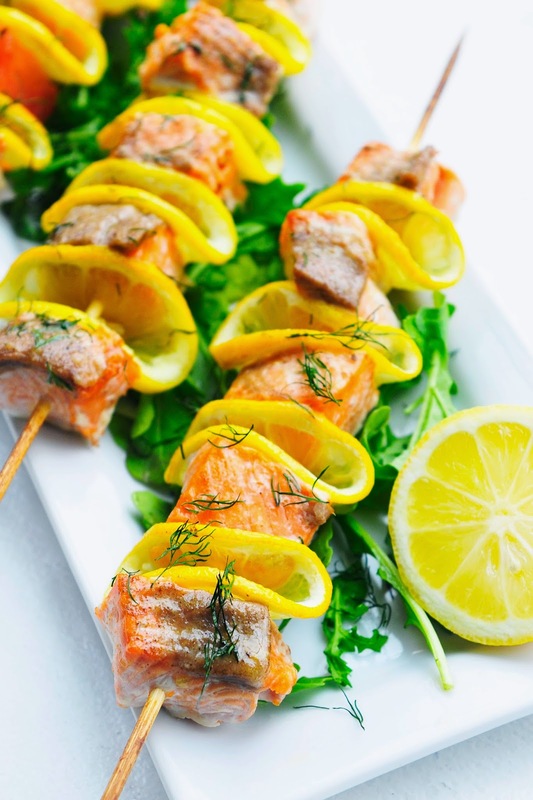 Add salmon, grapefruit chunks and lemon slices to skewers in any order. 5. With a pastry brush, brush each skewer with olive oil. 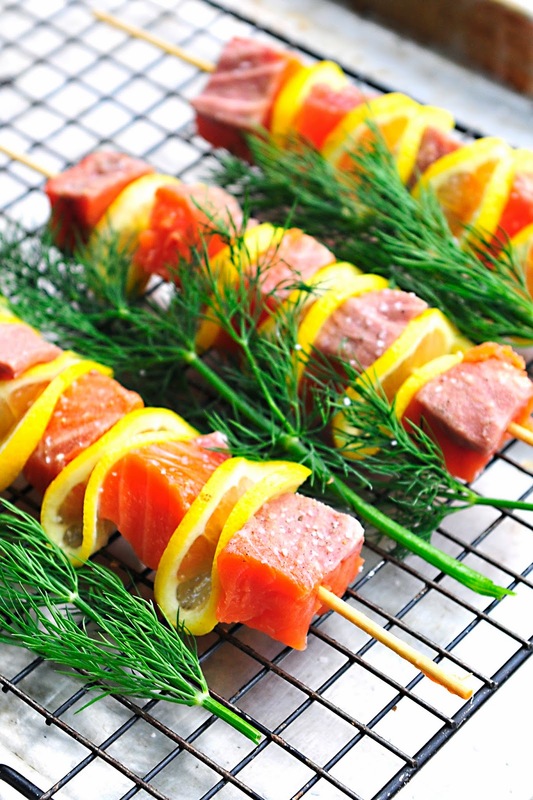 Lay long stems of dill next to each skewer. See picture. 6. Bake for 12-15 minutes. Try not to over bake. 7. 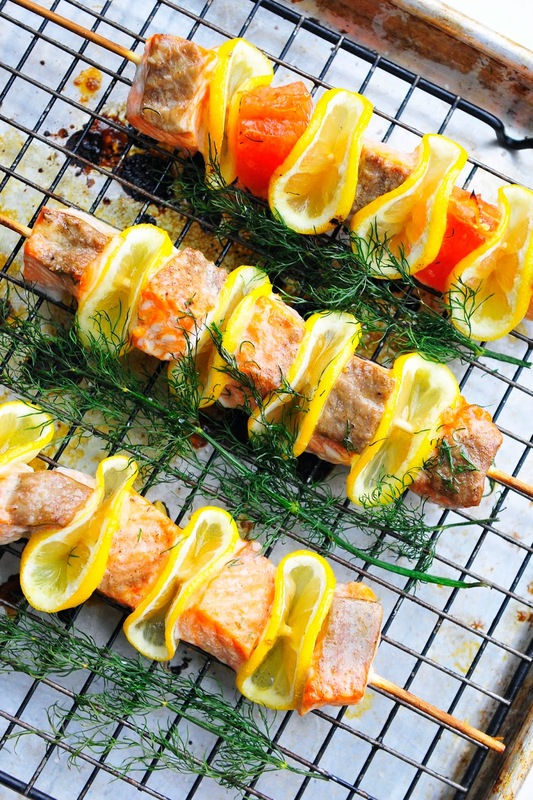 Crush baked dill over each skewer and serve.